Kristina's birthday cake was one of two that I actually made for her, both in the same week. The first cake was for her actual birthday (The Hint 'o Mint Chocolate Cake) and this one was for for a little girl's night out she was hosting the Saturday that followed. Since she's one of my biggest cheerleaders in life, it was hard not to spoil her a little bit. 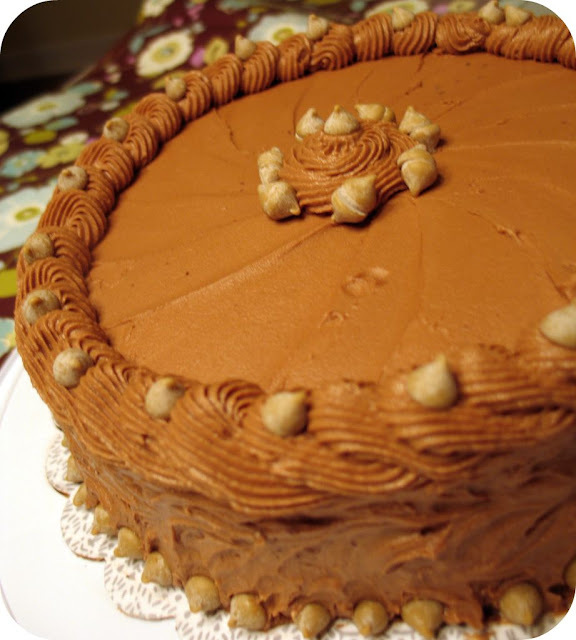 I was inspired to make this cake after gazing this beautiful cake's photo on Pittsburgh Needs Eated's blog. Along with the photo, the author mentioned that she got the recipe from The Cake Book by Tish Boyle. Not having ever heard of her, I promptly found her website and decided in an instant to not only make her Brooklyn Blackout Cake, but to buy her book, which is a keeper! The cake was a big success, even though I rushed it a bit. I should have made the filling the night before but time just got the best of me. I was in a hurry and only let the pudding chill for about 45 minutes. As such, it wasn't as solid as I had would have liked and made for a very moist cake. This wasn't a bad thing necessarily, it just made for a messy slice (I like seeing neat layers when I cut). Next time, I'll be sure to plan ahead. The recipe that follows include the weight of several of the ingredients. For those of you who don't own a digital food scale, please go buy one or put it on your wish list. They aren't too expensive (less than $30). Just be sure to get one that has both metric (grams) and imperial (ounces) readouts. Seriously, weighing flour, sugar, and various other ingredients is *so* much easier than using a measuring cup or spoon! It speeds up the process and cuts down on the number of dirty utensils you have to wash too. 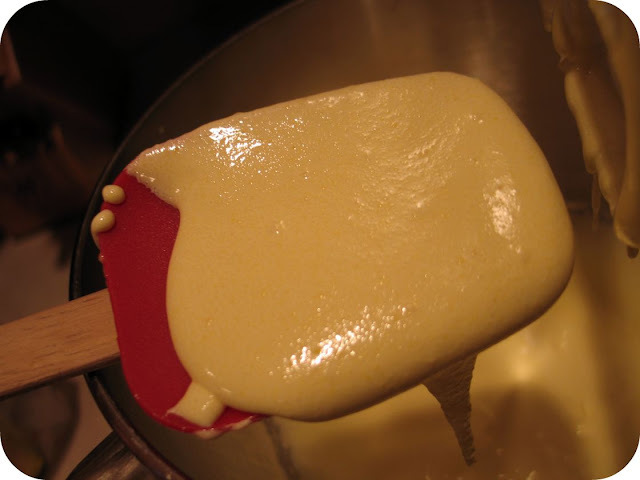 In the bowl of an electric mixer, using the paddle attachment, beat the egg yolks, sugar, cornstarch, and salt at medium speed until pale, about 1 minute (see photo below). Position a rack in the center of the oven and preheat the oven to 350F. Grease the bottom and sides of two 9-inch round cake pans. Dust the pans with flour, tapping out the excess. 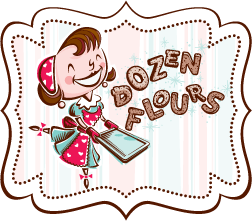 In the bowl of an electric mixer, sift together the flour, cocoa powder, baking powder, baking soda, and salt. Add the granulated sugar and, using the paddle attachment, mix at low speed until blended. In a medium bowl, whisk together the eggs, egg yolk, buttermilk, melted butter, and vanilla extract. While mixing the dry ingredients at low speed, add the egg mixture in a steady steam. Scrape down the sides of the bowl with a rubber spatula, then beat at medium speed for 1 minute, until well blended. Add the hot coffee at low speed, mixing just until blended. Remove the bowl from the mixer stand and stir the batter from the bottom of the bowl a few times to thoroughly blend the batter. Scrape the batter into the prepared pans, dividing it evenly. Smooth the batter in each pan and bake the cakes for 30 to 35 minutes, until a cake tester inserted into the center of each cake comes out clean. Cool the cakes in the pans set on a wire rack for 10 minutes. Invert the cakes onto the rack and cool completely. Stir espresso powder and vanilla in small bowl until espresso dissolves. Stir chocolate in top of double boiler set over simmering water until melted and smooth. Remove from over water; cool. Using electric mixer, beat butter in large bowl until fluffy. Add espresso mixture and corn syrup; blend well, scraping down sides of bowl occasionally. Beat in melted chocolate, then powdered sugar in 3 additions. If frosting is very soft, freeze until firm enough to spread, stirring occasionally, about 10 minutes. Using a long, serrated knife, cut each cake layer in half horizontally to make four layers. Place one cake layer, cut side up, on a serving plate. Remove the chilled pudding from the refrigerator and whisk it until it is smooth. Using a small, offset metal spatula, spread a third of the filling over the layer. Top with another cake layer repeat process remaining three layers. 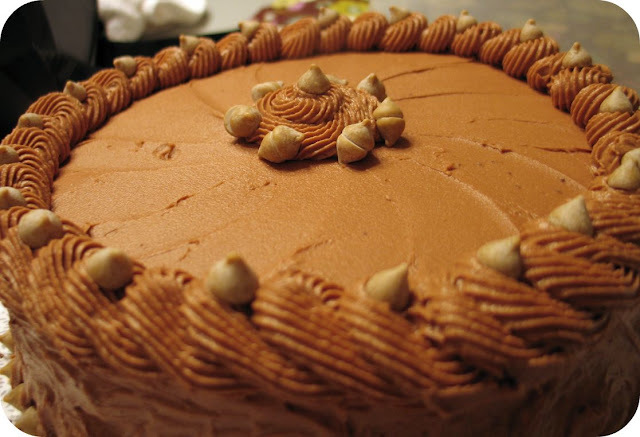 Spread a thin crumb coat of frosting on the cake to "seal". Return to the refrigerator for 30 minutes or more until the frosting is set and is well chilled. Spread frosting over top and sides of cake and decorate with Cappuccino Chips, shaved chocolate, or even cake crumbs to your heart's content. I don't have a kitchen scale, but maybe now I need one! This looks great! And to get two birthday cakes - what a treat! Have you tried making a Brooklyn Blackout Cake? Sooooo delicious! Chocolate cake, chocolate pudding, and then the crumbs of the cake cover the whole yummy thing. Oh my! I always wondered "why" a scale rather than cups. Now I know! I think I'll ask for that for my b-day next week... Lord knows it couldn't hurt in the dieting department either! Bridget - Thank you! I love my kitchen scale. It comes in handy for so many things, like when I need to evenly distribute batter between two cake pans or when I'm making fondant bugs and I want them all to be the same size. Wow this looks great! Two birthday cakes - I'm jealous. Gorgeous! Pretty good! This cake is fantastic! Looks yummy! I want a bite! No, two! I'm thinking, I want three, or 4...? Come to know my blog, Chocorango. Julia, my b-day is July 13th, in case you were wondering, you know, for future reference. LOL! I like how you decorated the cake with the chips! You always do such a lovely job. You know I know nothing about coffee as I don't drink it. What's Java another name of coffee? I taste mocha...despite not liking coffee I could be missing out on something wonderful. Julia, I don't know how I'm going to find the time to bake all the recipes I bookmark from your site. This one looks just fantastic! I agree 100% about the scale - I wish more recipes were done in weight rather than volume - it's more acurate. I love my scale. So beautifully decorated, and I bet it tasted fabulous too! how did i miss this?! it looks delicious. i love how your cakes always have so many parts... and then they're decorated so beautifully! you can tell a lot of love went into them. also, i FINALLY made stuffed pancakes with apples. i'm gonna post it sometime this week, so i'll finally blog thank you for that awesome apple peeler!! looks fantastic -- i took a pastry class recently and the instructor drilled into our heads that weighing ingredients is a must. i'm worried to put up recipes in weights though, because so few people do it!